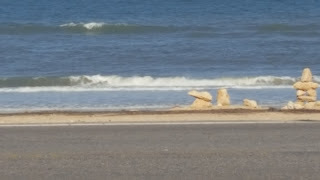 Exploring Palm Coast, Bunnell, Ormond Beach, Daytona, St. Augustine, Port Orange, New Smyrna and beyond. 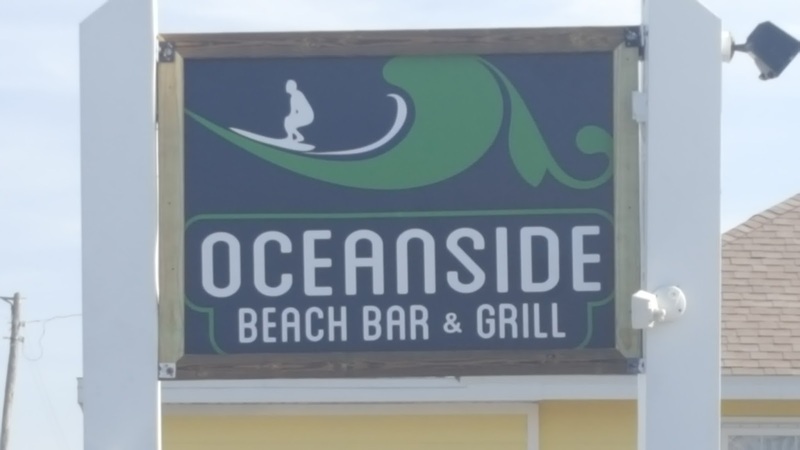 Highlights & Features: You've probably guessed by now but one of my favorite things is Oceanfront dining and Oceanside has just that! This place covers it all, great atmosphere, great location and great food. Mr. Suncoast and I have been several times and have never been disappointed. We think their best dishes are the gyro, pizza, steak sandwiches and hamburgers. And, they are open for breakfast every day. We haven't tried it yet but some reviewers rave about the flaming cheese. We'll have to check it out. 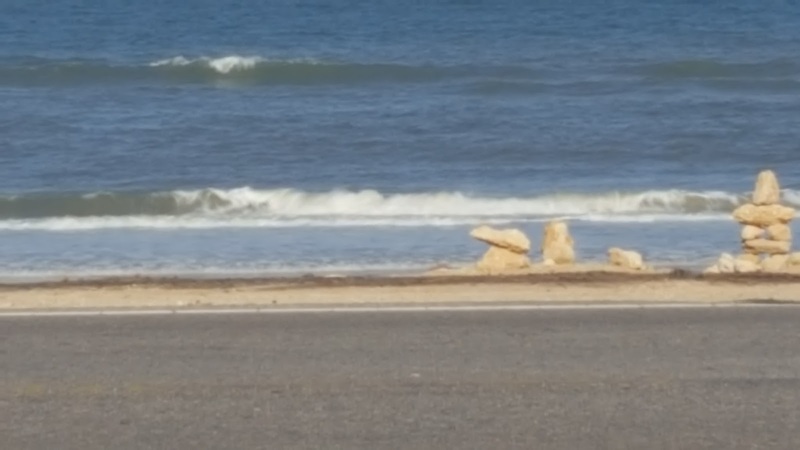 Oceanfront, oceanfront, oceanfront. What more can I say? 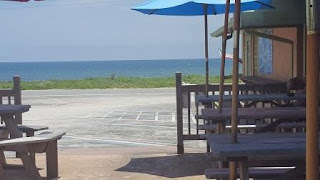 This place sits along Highway A1A and since it has it's own parking lot, there is usually an unobstructed view of the ocean (see picture to the right). The food is pretty good too. We have visited twice and have had the opportunity to try a soup of the day (vegetable barley), potato skins and a patty melt. All were very goo, particularly the soup. No canned stuff here. 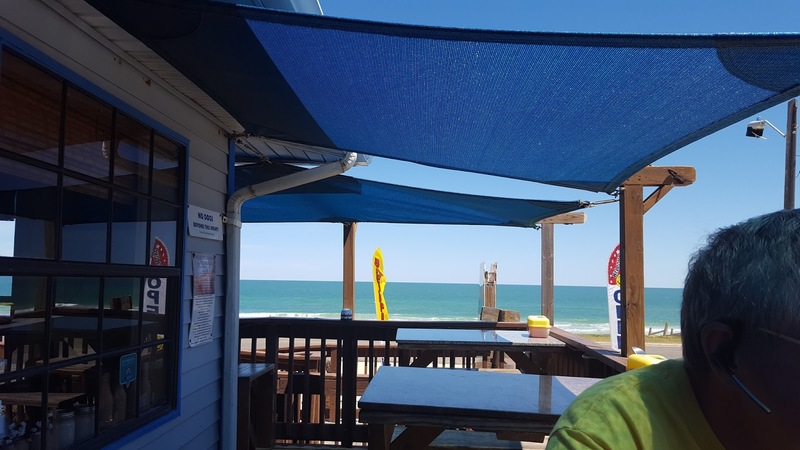 Two bars, one with a large picture window allowing indoor patrons a fine view of the water. Smoked meats smell absolutely delicious every time you drive by. 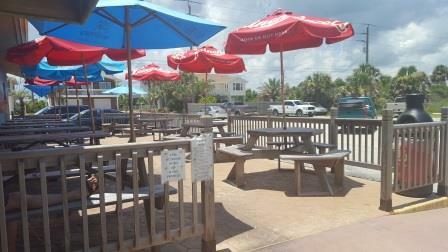 Indoor and outdoor seating and a full separate bar. Clean and welcoming with a very friendly and attentive staff. Cool and unique in house specialty cocktail menu. Convenient to-go baskets designed for the beach or picnics. 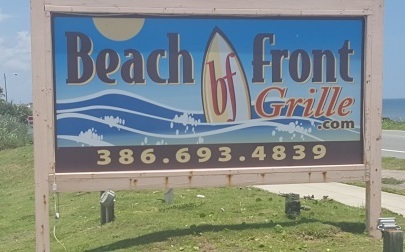 Located next to Veterans Park at Flagler Beach. Two house-made BBQ sauces - one sweet and one hot. We didn't try the hot sauce but the sweet is very good. Specials: Happy Hour 3pm to 6pm with food and drink specials. Bright and vibrant yet modestly simple decor. Just beautiful. Creative menu with fare you don't see in other Mexican establishments. They like to say NYA Mexican Food (as in Not Your Average). Well prepared and delicious food. 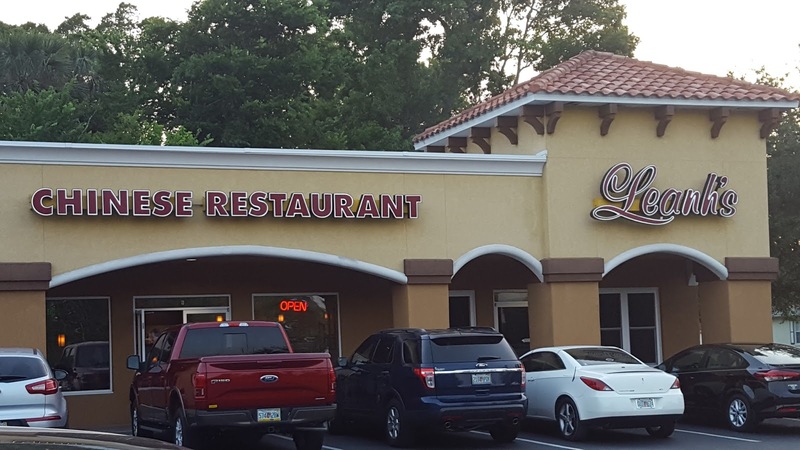 Try the Empenada appetizers - very good. At 5:30 on a Friday they were packed but we were seated right away. Specials: Happy Hour plus periodic daily specials. Highlights & Features: Number one, GREAT coffee. Throw your designer coffee gift card to the wind. 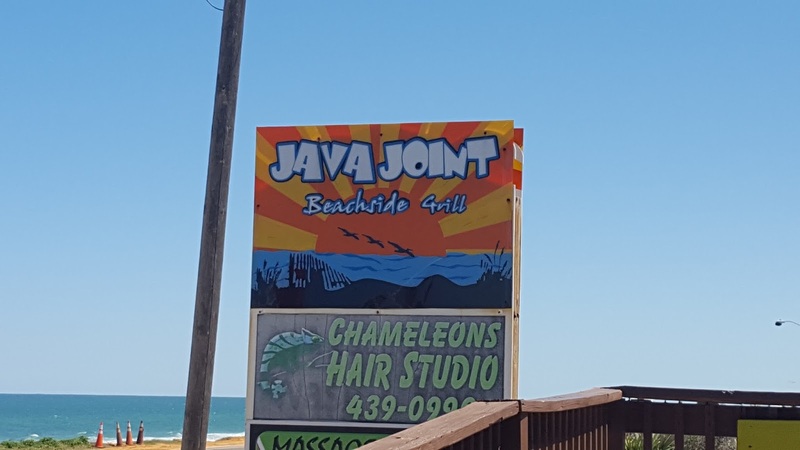 This place has a great brew and super friendly service to boot. You can't beat great coffee with oceanfront indoor and outdoor (dog friendly) dining in the morning or afternoon. They serve breakfast and lunch and their offerings are amazing. For breakfast try a Benedict or Quesadilla. For lunch try a mouthwatering burger. You will not be disappointed. Psst... they do serve wine, beer, & specialty morning drinks! 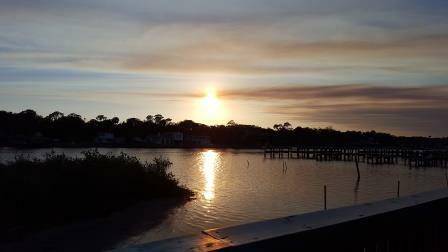 Specials: See website for any upcoming specials. The day of our visit we had business in Daytona so I took to TripAdvisor to find a place for dinner. Leanh's was listed as the #1 restaurant (not just the #1 Chinese restaurant) so we decided to give it a try. We arrived around 5:30pm or so on a Wednesday night and they were packed. Even though they were very busy we were able to be seated right away. 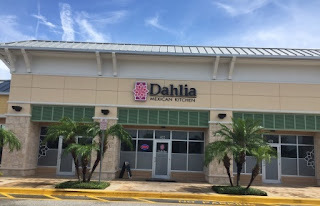 The service was fast and friendly and the food was very good. Mr. Suncoast commented that the wonton soup was the best he'd every had. And that's saying something as every time we eat Chinese he orders wonton soup! The service was fast and friendly. 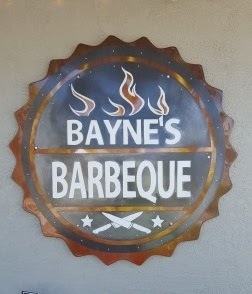 If you are in Daytona this one is a must to try. 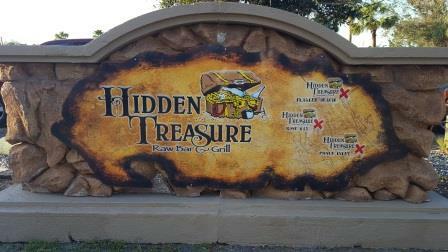 Highlights & Features: This Pirate themed treasure has three locations. 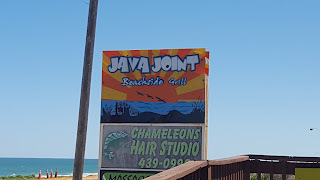 One in Flagler Beach (the subject of this post), one in Ponce Inlet, and one in Port Orange. This is a very fun place with lots to offer. Looking for live music? You're in luck. There are four spots where live music might occur; two outside and two inside. 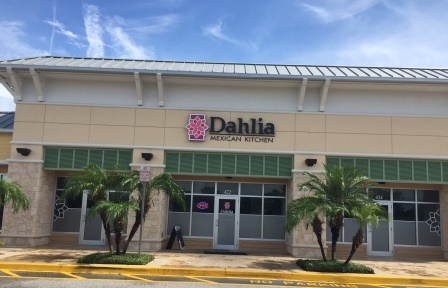 The food is good and the staff exceptionally friendly. Welcome to my blog. I moved to Florida from the mid-Atlantic area in late 2015. Since arriving I have been exploring everything 'food' here in the Sun Coast. Because there are so many people making the move to this area I thought I would share what I have learned. Rather than offer 'reviews' if you will, my focus will be on things like Features, Specials, and my Highlights. I would like this to be a quick and easy reference guide for everyone! You can use the Labels list to quickly find restaurants that match your current whims. Copyright 2012. Simple theme. Theme images by kcline. Powered by Blogger.